Working crazy hours can make sleep even harder to get than normal. Upon the recommendation of a co-worker I decided to try a sleep mask. (I totally thought I was just throwing my money away, but thought, what the heck!! I need sleep!) So I bought an inexpensive one from a big box store. OMG!! I was transformed into a happy sleepy girl. This really made a difference for me. Knitter brain engaged now, I started thinking…..”are there any knitted sleep mask patterns out there?” Whoa Nelly are there! Everyone needs a good nights rest! Photo from dogster and is Sabrina a American Pit Bull Terrier/Weimaraner mix! I know how CUTE!! Included here for any sleep deprived people, great for stash busting, and random gifts, here are an assortment of sleep mask patterns, from functional to funny! -Awards for the best looking knitted sleep mask pattern, published in Knitty summer 04, Velvet Oblivion from Stephannie Roy who blogs at AndSheKnitsToo, pattern looks easy. 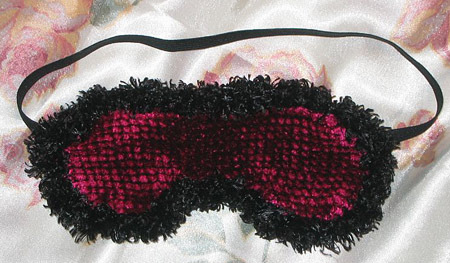 -Two sides of drunkenness sleep mask knitting pattern free pdf, thanks to fuzzbotdesigns.blogspot.com, this also has charts for beer, wine and booze! It had me smiling. -Ruched Sleep mask from Sara Core at Exchanging Fire blog, pretty mask! -From DesiKnitter a Chevron sleep mask, I like the thick looking band around the head, and it is good looking. -A no frills knitted sleep mask pattern (rav link) from Elizabeth Martin, suitable for the men in your life. Now go get your needles out! Wow, I didn't realize there were so many sleep mask patterns! I too have been told that sleeping masks might be good for me and I just happened across your post! I'm loving the pink and black one and the owl one is super cute too! What Do You Like To Do While Your Knitting?